San Ramon FC is announcing its competitive program tryouts for the upcoming 2019-2020 season. Players interested in playing in San Ramon FC's competitive or select programs should plan on attending all tryout dates for their birth year but must attend at least one day to be considered for either program. Beginning with the U8 Academy for players born in 2012, the competitive program includes teams for the U9-U19 age groups (birth years 2011-2001). The U8-U12 tryout schedule will take place at various times between April 22 and April 27. The U13-U15 tryouts will be held April 29 through May 2. The U16-U19 age groups will tryout between May 6 and May 9. It is free to participate in the tryouts, however, registration is required and should be done on the club website. The club’s competitive program provides players with age and ability appropriate training and competition under the guidance of the San Ramon FC professional coaching staff. U9-U19 competitive teams play in year-round leagues organized by NorCal Premier Soccer, as well as various tournaments throughout the season. The U8 Academy participates in various playdates and events throughout the year against local clubs. 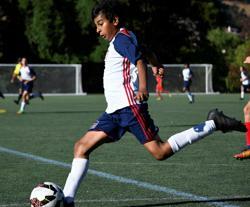 For questions about our Boys’ Competitive Program, please contact Mani Salimpour, the club’s Boys Technical Director. For our Girls’ Competitive Program, please contact Zlatko Tomic, Girls Technical Director.